PRINTER COMPATIBILITY:HP DeskJet 1110 Printer, HP DeskJet 1112 Printer, HP DeskJet 2130 Printer, HP DeskJet 2131 Printer, HP DeskJet 2132 Printer, HP DeskJet 2133 Printer, HP DeskJet 2134 Printer, HP DeskJet 3630 Printer, HP DeskJet 3631 Printer, HP DeskJet 3632 Printer, HP DeskJet 3633 Printer, HP DeskJet 3634 Printer, HP DeskJet 3636 Printer. HP ENVY 4512 Printer, HP ENVY 4520 Printer, HP ENVY 4522 Printer, HP ENVY 4516 Printer. HP OfficeJet 3830 Printer, HP OfficeJet 3831 Printer, HP OfficeJet 3832 Printer, HP OfficeJet 3834 Printer, HP OfficeJet 4650 Printer, HP OfficeJet 4652 Printer, HP OfficeJet 4654 Printer, HP OfficeJet 4655 Printer.WHAT DO YOU GET FROM VALUETONER TODAY?1. You will receive a (2) Pack of cost-effective and well-packaged HP 63XL Remanufactured Ink cartridge replacements for use in your valued Printer.2. You will enjoy high quality printing results and page yields equal to OEM Ink cartridges.3. You will receive access to our professional customer service team that is fully dedicated to solving any problems you have with the product and ensuring a great purchasing experience. Valuetoner cares about all our customers. Please contact us anytime using the \\"Contact Seller \\" option within the \\"Orders\\" section on Amazon. 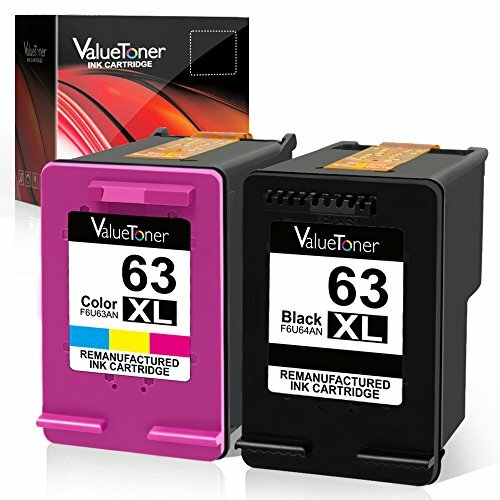 FOR OPTIMAL USEPlease follow the guidelines below:Step 1: Please take off the protective cover before you install the ink cartridges.Step 2: Please remove protective film of cartridges.WHY CHOOSE VALUETONER?Valuetoner cares about Amazon customers.We appreciate all of your feedback and reviews. We use them to create a direction for us to continuously improve our products.ValueToner cares about environment.We provide cost-effective remanufactured ink cartridges to give you broader choice for your daily printing needs. After the cartridges are empty, we suggest you to take or send them to a local recycling center so that they may be properly disposed of.ValueToner knows the whole industry.We don’t just sell ink and toner cartridges, we solve your day to day printing problems by providing you with the best solutions and product experience. Warranty&Technical Support: 24-Month limited Warranty. If you encounter any problem, please CONTACT US for technical support, replacement or refund. Color: 1 black, 1 tri-color.